Asus Windows 8 PCs--Innovative or Just Novel? Asus has revealed a new lineup of Windows 8 devices at the Computex 2012 tradeshow in Taiwan. The collection includes a couple angles on the hybrid laptop / tablet concept, as well as a desktop that tries to get in on the tablet action as well…sort of. The question is whether these devices are truly innovative, or just novelties. 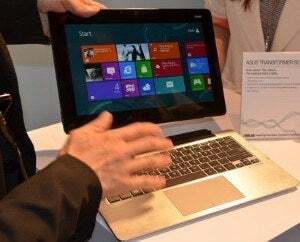 The Asus Transformer Book display detaches to become a standalone tablet. The Taichi takes a different approach. It is an ultrabook which has a display on both sides of the top half. When the device is closed, the top display acts as a tablet—albeit a bulkier tablet than most because it’s still an ultrabook. When open, the display can operate independently with one person using the keyboard and touchpad on one side, and someone else using the touchscreen display on the other side for with the Windows 8 Metro interface and apps. The third device unveiled by Asus is the Transformer AIO (for “all-in-one”). The multitouch display can be separated from the guts of the AIO and used as a wireless display. Kudos to Asus for thinking outside of the traditional box, but I’m not sure these devices provide any practical benefits for the ‘post-PC era’. The different devices seem innovative in their own unique ways, but seem like they try to straddle the line between PC and post-PC and deliver an “all of the above” solution. I haven’t seen or used these devices in real life yet, so I will withhold my final judgment until I’ve had a chance to experience the new Asus Windows 8 devices firsthand. I can see the benefit of having a laptop with a detachable display that pulls double-duty as a tablet, but the Taichi and the Transformer AIO seem to put form over function in delivering features that are innovative, but impractical. To be fair to Asus, it is by no means the only Windows 8 vendor trying to simultaneously deliver Microsoft’s upcoming flagship operating system, and a mobile tablet experience to compete with devices like the iPad. Businesses may appreciate the option to buy one piece of hardware that fills both roles, so perhaps the novel approach will pay off. What do you think? Are you excited to for devices like these that merge the traditional Windows 8 experience with a Windows 8 or Android tablet experience? Or, would you rather have a Windows-based laptop or desktop with a completely separate tablet?